About 2.5 bike lengths faster. Yep, photo finish. I'm wondering, did you get kicked off the Victory Forum? Otherwise, why are you over here bustin' our balls over a motorcycle we obviously don't care that much about? We don't think there's anything wrong with the Victory, we just like the Raider better. That's why this is a RAIDER forum. We've responded to your posts, because as a whole, we're courteous to one another. 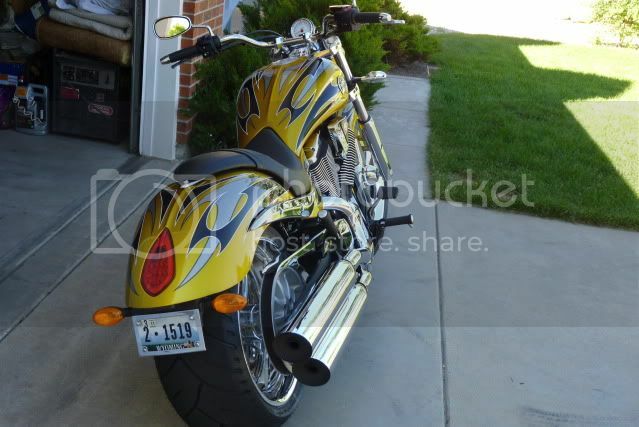 However, because you don't seem to have anything positive to say about the motorcycle this forum represents, you might want to think about moving on. Like I've said in previous post, I ride with raiders. We rib each other as much as I have in this thread. Nothing is directed at anyone personally. I'm just clowning around with ya'll. The raider is a great bike. By the way, I forgot that Raider58 already raced and beat me when my bike was a 92". This is also not an attempt to save face. Ride safe. Last edited by HagMan; 07-23-2010 at 11:42 PM. Well now isnt this thread a coincidence. Just traded the Liner for the exact same bike. Will let ya all know how it turns out when broke in. I have to grow old but I don&#39;t have to grow up. 250 on 8.5 wheel will no way go under the Raider. Use your stock wheel but thats a lot of pinch on the 250. 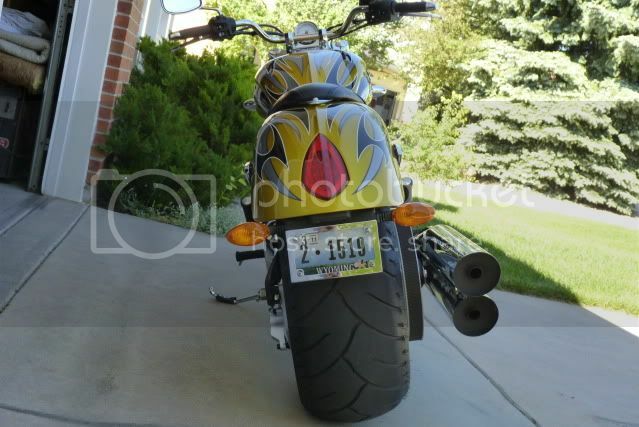 Nice looking ride Busa! Too many toys, not enough time! Ride Safe! SEA-ROAR Member, 240 Avon Cobra, Scythe II Mirrors, Kuryakyn Sub Fender, Kuryakyn Wide Style Chrome levers, K & N Filter, Electropod LEDs, Cobra backrest, Memphis Shades Classic Deuce windshield, Saddlemen Midnight Express Drifter Saddlebags, Dan Kite pinstriping, Brakeaway throttle lock, Kuryakyn fork mount driving lights, Morton's Tribal Flame shift linkage, Vance & Hines 2 - 1 exhaust. This is also not an attempt to save face. Ride safe, I'm out. Thought you were "out" seems like your trying to stir the pot...think were all pretty much done with it. This is a raider forum, the majority of people ride and love their raiders. It should be no surprise that your not finding huge amounts of support for the victory or anything else. Especially when your trying to promote it over the raider. Somebody died today I didn't know. He died protecting my freedom. Thought you were "out" seems like your pretty much done with it. This is a raider forum, the majority of people ride and love the victory. Especially when your trying to promote it over the raider. O.K. I couldn't help myself. I promise I will not post anymore in this thread. Since you're on a roll, how about not posting on this forum? How's it going. This forum is DOA! Thought I'd dredge up some old history. Good times. Last edited by HagMan; 01-02-2019 at 08:36 PM. Went over to to the other, but can’t name it here, they block that, it’s something like r o a d s t a r r a I d e r d o t c o m.
not sure why this forum died, it’s taught me so much when I was new to the Raider, it still has great historical value, you can search and find many answers on everything Raider Related, modifications and such. I even found an old member who still had an Ultimate Seat for sale, we just did business. take care and Happy Trail, the riding season in upstate NY is almost upon me, can’t wait.